So March was a pretty rough budget month. We knew we would go over in some categories because of Kat’s visit, but we also got hit with some extra expenses because it was a long month. In addition, we pre-booked some campgrounds into the August time frame and about $719 of the campground fees are actually paying for campgrounds in future months. I thought about whether or not to go ahead and put those payments in the future months, but decided to leave them in the month the cash was actually expended. This budget isn’t just about how much you spend but when you need the cash, so going forward the payments will always be reflected in the month they happen. Prepaid campground fees $719. The month only actually cost us $563.60 in campground fees because we had prepaid at Rainbow Village and St. John’s was very inexpensive at $17 a night. We also did receive a credit from the campground in Apopka which brought that week down to a more reasonable number. Groceries were way high this month with an overage of $276. The bulk of that was $131 at the Asian market and $70 for a very nice steak dinner for the kids one night, but yeah, this was not good. We are going to start tracking food versus non food items separately to see if we can get a handle on this and Lee is going to rearrange our cabinets so we can meal plan around what we have instead of double buying because we don’t know we already have something. Dining out; I am thrilled about that, we only went over by $90 because we ate out in numerous amusement parks throughout the week. Feel the same about entertainment which was only over by $68 and the overage was mainly this really nice kite that Lee bought for OBX. Part of our registration fees hit this month. $32 for registering domicile and $119 for drivers licenses both of which are one time costs. In April we will get our license plates, which should give us an idea of that annual budget. Tolls was $42.50 this month and that was all spent in the week around Orlando. If you are planning on going to the parks, build that cost into your budget. Clothing was over $188 because Lee bought several year’s worth of shirts, but we are ok on the annual budget of $600. We were under in Fuel, Cigarettes, Haircuts, and laundry all of which helped put some money back in. So it was not the best month we’ve had but it could have been way worse by far and we had a good budget discussion around some of the items we are still struggling with. Plus it’s life right?…your kids come to visit, you spend more than you want on food in a month….these are things that happen whether you live in a RV or in a regular house. This entry was posted in Uncategorized and tagged Full timing budget, RV Full-Timing. Bookmark the permalink. Thank you for posting the details. Good for you guys! Our March was not bad either, except for our side trip to Pittsburgh, which was about $850 for 3 days! OUCH! Bill does ours different though – when we pay for CG’s ahead of time – he puts that in the month it’s for, but I understand what you are saying also. Just different accounting methods – that’s what he calls it. Whatever works! I think I am about to give up looking at our budget monthly and just look at it quarterly instead. We never seem to hit it! We are coming into a money making period when we start our jobs next Monday. They are paying for our campsites and our fuel so we should make up some of the over spending we did the past couple of months! First off, thank you very much for posting actual costs. 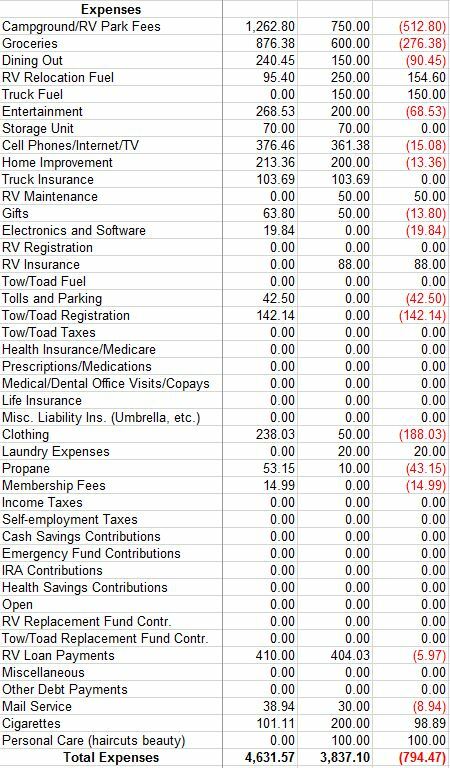 I’m getting ready to jump off myself in another year or so and I need to plan for costing while on the road and information like this is pure gold and hard to come by. I don’t know what you are using for budgeting, but have you looked into Ynab? I’m finding it’s very adaptive and is actually very easy to use.